I've seen this thing first time in my new room. Dual flush tank (see image 2, it's not an actual photo, but where I live has similar thing as this one). Now, in image 2, you see a dual flush button. Now I searched a lot on Google. Everyone told you have to press one of the buttons depending on the need of amount of water. But none of them told whether you have to press and hold or just press and release. Of course, finally I verified it myself. When I just pressed one of the button and released it at same time, very little water came (insufficient). I thought something is wrong as I'm used to the flush shown in image 1. But then suddenly it came up to mind. I pressed and didn't release it. I got what I wanted - sufficient water, it kept flushing until the water emptied! The question is: Are dual flush made to press and hold (not release until wasted is flushed fully)? Or is it something wrong with the flush I'm using? Further, can both buttons be pressed simultaneously for full flush? As with all mechanical devices, there are differences between different items of the same basic design. 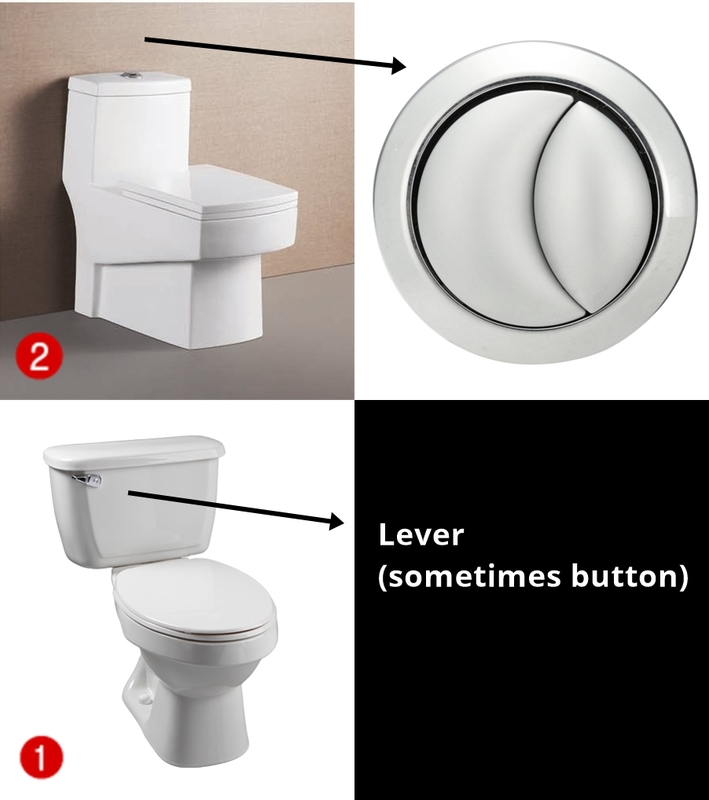 If you are around the same toilet a bit longer, test out the different buttons and the different ways to push them. Most of the time you press the smaller, pointy, button for the smaller amount of water. One firm press and a short hold should do it. The bigger, half moon shaped, button alone or both buttons in combination should give you the bigger flush. It depends on the actual device whether you only should push the bigger part or both. A bit of testing should show that. Next time you need to use the full load, first push the bigger button and once that (part of the) cistern is empty, push the smaller button. If it still holds water, pushing both buttons will give more water. On the other hand, if it does not give water immediately, the bigger button works both cisterns. Again a single firm press and a short hold. It is well possible that this particular toilet does not perform as it is supposed to do, due to a mechanical problem or a wrong setting. Compare it to other toilets with the same set of buttons, if you find them in the same area, or if you are sure of a failure, ask your host or the owner of the building to send someone in or, if not in an area with water shortage, use as it is if it does its work as is.